We’re very excited about the upcoming year as we have 21 new Westerns (5 new series) and 1 new Action book scheduled for release in 2019. Each month, members of our Book Club will automatically be shipped the new releases for that month. 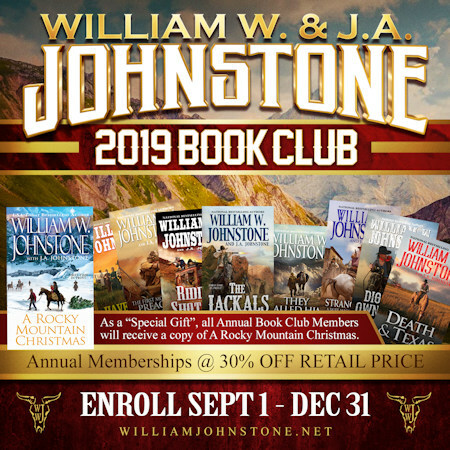 joining our 2019 Book Club, members will SAVE 25% off the published price of each new book released in 2019, and your membership price includes shipping and handling. This is an additional 10% discount from last year. In addition, Annual Book Club members will receive a 25% discount on all other book orders and merchandise purchased during the year. As a “Special Gift”, all Annual Book Club Members will receive a copy of A Lone Star Christmas. This is the first book in the Christmas Series and will make an excellent “gift” to someone if you already have a copy! ANNUAL MEMBERSHIP enrollments will end December 31, 2018.